Ong's offer was too good to be true. 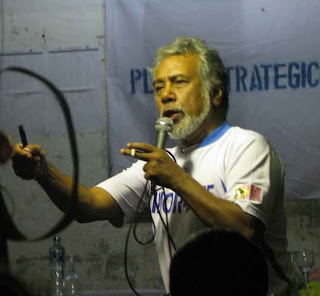 In September 2009, Timor-Leste's Minister of Finance received a proposal from "Asian Champ Investment Ltd," (ACI) represented by Datuk Edward Ong, the President of Sutera Harbor, the company behind Pelican Paradise's proposed "five-star hotel" project in Tacitolu. ACI asked the Minister to deposit $1.2 billion in cash from the Petroleum Fund in their "blocked" account at Hong Kong & Shanghai Banking Corporation (HSBC). They said they would pay 7.5% interest in advance and return the money in a year. ACI told the Minister to make a decision within 15 days, and she asked the Petroleum Fund's Investment Advisory Board (IAB - a group of advisers appointed by the Minister of Finance under the Petroleum Fund Law) for advice. The IAB unanimously sent a memo (released a year later) recommending against ACI's proposal and urging that normal investment processes be followed, which do not include investments in cash. The IAB and Minister asked the BPA to prepare a report on the ACI proposal, which we La'o Hamutuk has not been unable to obtain. In November 2009, La’o Hamutuk learned about this attempt to scam the Petroleum Fund, and researched ACI, which may or may not exist. Our repeated requests for information from the Banking and Payments Authority (BPA), IAB and Ministry of Finance were declined or ignored. The Ministry asked us to delay publishing, which we did, although their promised information never came. The issue was mentioned several times on the BPA website, and La'o Hamutuk raised it in a BPA press conference, but local and international media never picked up on it, demonstrating that transparency also requires attention. The IAB discussed the ACI proposal at meetings on 18 September, 23 October, 11 and 20 November (including responding to an email from La'o Hamutuk) and 15 December 2009 (at which time the IAB Chairman incorrectly "noted that the Minister had responded to La'o Hamutuk's request for further information"). More information became available only this week, with the publication of the 2009 Annual Report on the Petroleum Fund, with its legally-required annex of all advice given by the IAB to the Minister. In April, the Government of Timor-Leste published a summary of their draft Strategic Development Plan for the next 20 years, and the Prime Minister began visiting each of Timor-Leste's 65 districts to socialize the plan. He finished this process on the night of September 11 (actually at 2:00 am on September 12) in Laulara, Aileu district. La'o Hamutuk attended this final meeting, and have posted some pictures of the meeting and the PM's presentation (2.5 MB). The full version of the plan has not been released, although we have published a leaked copy, as well as our analysis of its feasibility and implications. Last week, a letter to the PM from acting UNMIT head Finn Reske-Neilsen was also leaked. La'o Hamutuk continues to follow this process, and we encourage everyone in Timor-Leste to inform themselves and share their perspectives on the decisions involved in this plan, which will have serious implications for decades of Timor-Leste's future. Reliance's block is the orange area at top right. Last June, the Indian oil company Reliance presented Timor-Leste with a draft Environmental Impact Statement and Environment Management Plan for a deep-water test gas/oil well they hope to drill in Block K of Timor-Leste's exclusive maritime area next month. La'o Hamutuk made a submission, urging the National Enviromental Directorate (DNMA) to reject Reliance's draft until the company makes significant revisions. Following a meeting last month with Government, civil society and other stakeholders, Reliance responded to comments by La'o Hamutuk and others, and submitted a somewhat revised version of their EIS and EMP, which DNMA is currently deciding whether to accept. Reliance has also announced that the well will be drilled by Transocean's Deepwater Frontier drilling ship. This is the first time Timor-Leste's Government has had to decide on approval of an oil well in Timor-Leste's exclusive area, and it is a critical test which will set the precedent for future oil and gas projects. We hope that environmental professionals in regulatory agencies will make their decisions based on technical realities to protect Timor-Leste's interests, and not on political or personal loyalties.